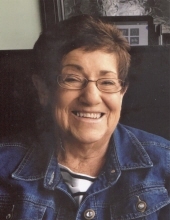 Linda Porter entered her eternal home on Thursday, February 7, 2019 after a several month battle with congestive heart disease at the age of 75. Born on July 17, 1943 in Sand Hill, KY, Linda loved spending time with her family and friends. Linda is survived by her loving and devoted husband, Don, daughters, Pam Geise (Rick) and Kim Davenport (Mark) and grandchildren, Megan, Tyler, Logan, Lucas and Lindsay. In lieu of flowers, please consider a donation to Queen City Hospice or First Baptist Church of Glen Este. "Email Address" would like to share the life celebration of Linda Frances Porter. Click on the "link" to go to share a favorite memory or leave a condolence message for the family.